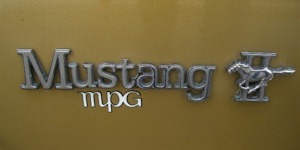 The 1976 Mustang MPG package was the name given to a Mustang II with the base level 4-cylinder engine. MPG stood for Miles Per Gallon which was pretty popular as the price of gas started to skyrocket in the mid 1970s. The best Mustang gas milage included the base level standard options with 3.18:1 rear axle ratio and manual transmission. Ford promotional photograph of a base level Black 1976 Mustang II MPG 3-DOOR 2+2 hatchback with standard chrome grille, fog lamps, and full wheel covers. The 1976 Mustang MPG models are any Mustang II equipped with the 2.3 liter engine and standard 3.18:1 rear axle ratio. This resulted in 34 mpg highway and 24 mpg city for the manual transmission; and 31 mpg highway, 22 mpg city for the automatic transmission. This photo is part of the 1976 Ford Mustang promotional catalog. Skiing anyone? Here is a nice Red on Red base level 1976 Mustang II coupe. No options visible here with the standard chrome grille, fog lamps, and full wheel covers. Ford called this the Mustang II MPG Hardtop because it came standard with the most fuel efficient engine (93 horsepower, 2.3 liter, 4 cylinder). More information on this car can be found in the 1976 Ford Mustang promotional catalog.